Our bitterly cold winter made me in the mood for a big bowl warm soup with lots of chunky vegetables in it, so that’s exactly what I did! Tasty, hearty and so easy to make! Heat the oil in a large saucepan and add the chopped onion, and garlic . Cook over a medium heat for a few minutes, until the onion is soft and translucent. Add the pumpkin,carrots,potato and celery. When the veggies are soft, remove about half the quantity from the saucepan and blitz with a stick blender or liquidiser. Return the blended soup to the saucepan adding a bit more water if the consistency is too thick. Add the cannellini beans and cook for a further 10 minutes. 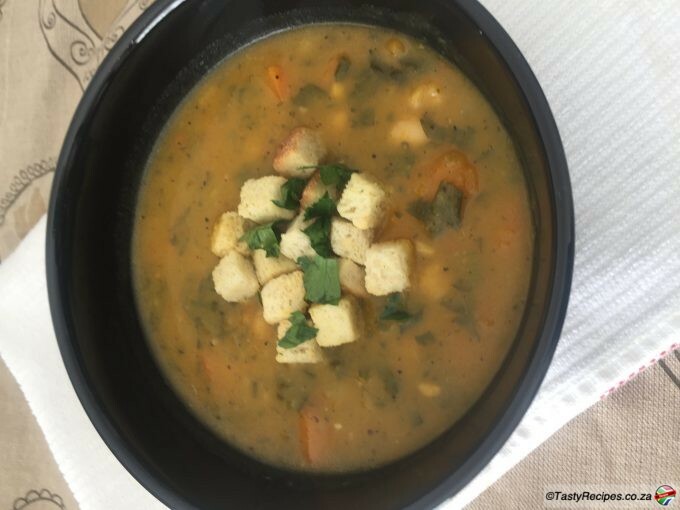 Serve the soup hot, topped with the crispy croutons, and some fresh parsley.